Despite the controversy at the end of Art Briles&apos; tenure, Baylor consistently had one of the best offenses in the nation during his time there. Although known primarily for their vertical passing game, Baylor also had a great running game. 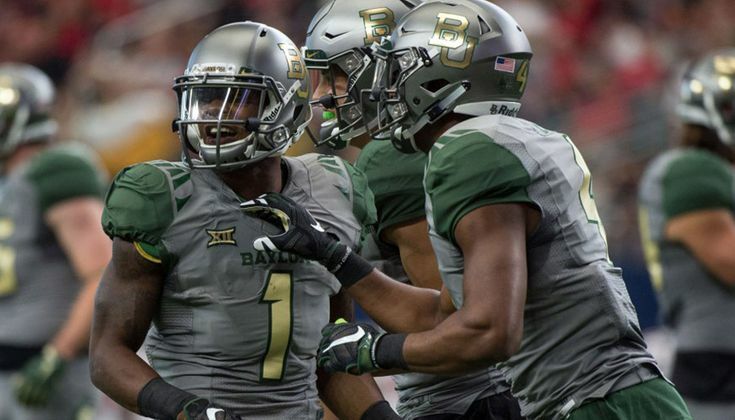 In 2015, Briles&apos; last season, Baylor ranked third in the nation in rushing yards per game at 319.6. Baylor excelled at adapting isolation run concepts typically used in pro-style offenses to fit their spread offense. 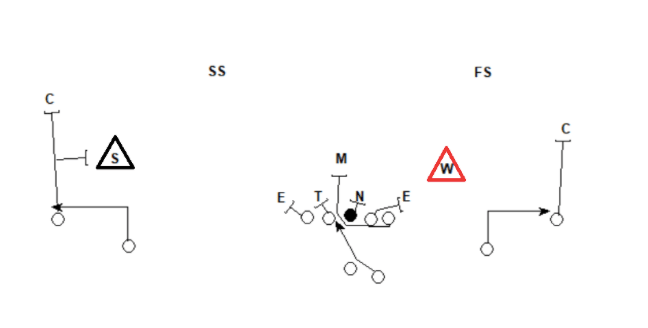 Baylor ran isolation schemes like this from spread sets in two different ways. Part one of this two-part series will be about how they ran iso by pulling their tackle instead of using a fullback. This run concept is commonly known as “dart.” Baylor ran dart 276 times throughout the 2014 and &apos;15 seasons for 1,823 yards (6.61 yard average) and nine touchdowns. With the way Baylor ran dart, it was best against five-man boxes. Because of this, they primarily ran the dart concept from 10 personnel versus teams who predominantly played with two-high safeties. When playing against teams who were primarily in single-high structures such as West Virginia, Texas or Oklahoma, dart wasn&apos;t a huge part of the game plan. The offense is trying to place both outside linebackers in run-pass conflicts with back-out screens to the slot receivers paired with the inside run. Rather than the traditional bubble screens used by most offenses, Baylor would have their slots take two steps upfield before backing out toward the sideline. The wide splits used by Baylor helps clear up the read for the quarterback and places these defenders in even more of a conflict. The QB will read the alignment of the field-side outside linebacker pre-snap. If he&apos;s tight to the box, then the QB will catch and throw the field-side screen. If he&apos;s expanded to the slot receiver, due to Baylor’s wide splits, he&apos;s too far away from the box to be a factor in the run. If he is expanded to No. 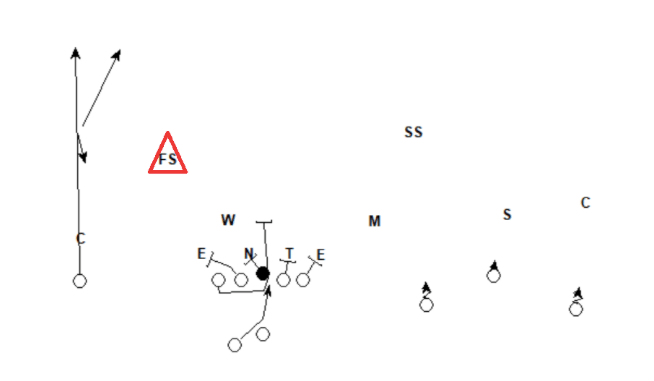 2, as he is in the diagram above, the QB will post-snap read the boundary outside linebacker. If he stays put outside of the box or widens with the slot, the defense is left with only five defenders in the box and the QB will hand the ball off to the back. If he dives in toward the box, the QB will pull the ball and throw the screen. The Sam linebacker is expanded to the field slot receiver, so the QB post-snap reads the Will. The Will stays outside of the box so the QB hands the ball off to the back. The playside tackle through backside guard take care of the four down-linemen, which leaves the offense with what they want on this scheme: the pulling tackle isolated on the Mike linebacker. This time, the Will jumps in toward the box as the QB meshes with the back, leaving the offense with good space on the perimeter for the back-out screen. Also note how the offense ran this play with the running back on the playside and still had the QB read a backside defender. Most teams will only have the QB post-snap read defenders who are aligned on the same-side as the offset running back, but Baylor would sometimes flip the read and have the QB read defenders opposite of the back’s alignment as they do here. When running their screens from stacked formations, Baylor would have the receiver in the back of the stack work up the field for 3 steps before turning for the screen. Note here how the receiver is already two yards downfield when he catches the screen. The thinking here is very similar to their double-screen RPO. If the read-key linebacker, the Mike in this case, stays outside of the box, the offense should have a five-man box to run dart against. If the Mike steps in toward the box, the offense should have good space to the No. 3 receiver on the stick route. Note here how the No. 2 receiver works to the outside a lot quicker on his screen than on the double-screen RPO. This is because he&apos;s trying to pull coverage away from the stick route. Baylor never actually threw this route to the No. 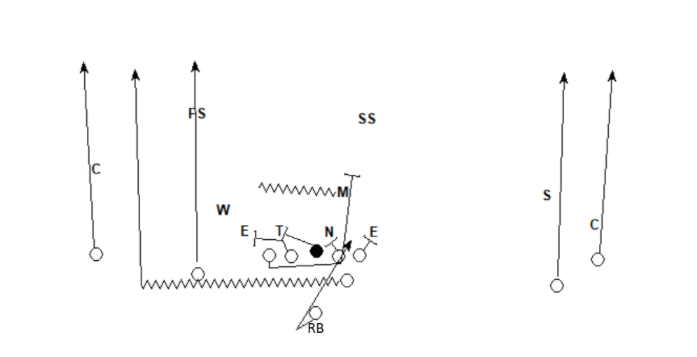 2 receiver when running this RPO. Baylor’s offense under Briles has been called “lazy” because of their tendency to give receivers certain plays off. As they do here, Baylor would frequently give receivers the play off when on the frontside of inside runs. The free safety drops down toward the box, so the QB pulls the ball to throw his choice route. The corner jumps outside as the receiver starts to work his release, so he takes the inside release and runs a skinny post route. Unfortunately for Baylor, they had one of their extra linemen in the game at tight end. Baylor could&apos;ve potentially scored on this play with a better receiver playing the tight end position. This is a really good job of game planning by the Baylor coaching staff. By understanding the responsibilities of each defender, they knew the Will would follow the H-back toward the perimeter on his arc block, creating good space for the dart play. The running back takes a jab step and gives a quick pump fake to the three-receiver side to try to influence the Mike linebacker, who&apos;s actually influenced to move outside of the box, and the pulling tackle works up to the safety. This was part one of a two-part series. 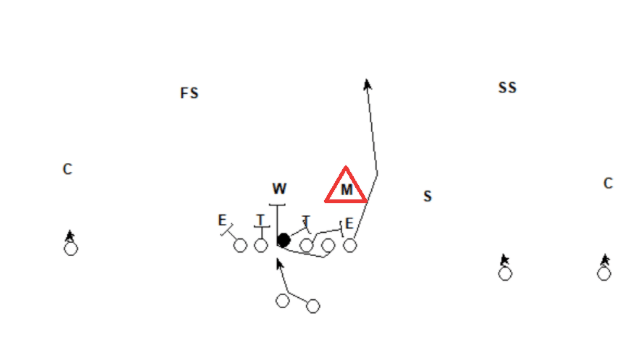 The second part will be about Baylor’s zone isolation concepts. Contact Taylor Kolste at TKolste20@my.whitworth.edu, or find him on Twitter @TaylorKolste. Check out more of his work at rileykolstefootball.com.